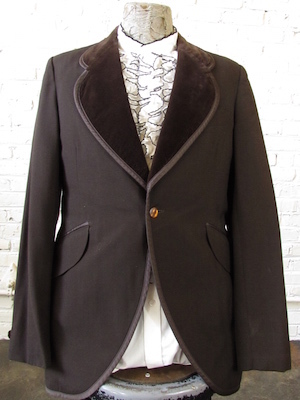 Super cool vintage 70s men's tuxedo jacket. 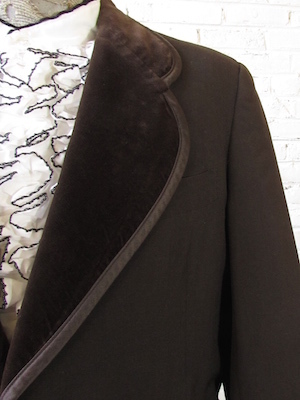 Dark "German chocolate brown" (think The Ladies Man) with brown velvet lapels edged in shiny brown satin. (The photos have been lightened so you can see the details. its a dark brown!) Nice wide rounded split lapels. 1-button front with a curved hem- the back looks like it has slight tails because the front curves up. Edged in the satin all around the hem and on the pockets. Decorative pearly button on each cuff. Made by After Six Masters Chicago. Funk-a-delic! I have 2 jackets in this size & style. Condition: Very Good. very faint fading at the back of the collar. may be slightly musty from storage. dry clean.